Yves on Stocks Crashing Up! Our frequent guestposter Yves Lamoureux, president of Lamoureux & Company, a market advisory firm based on behavioral economics, has a view on stocks: up! Neely sees the S&P in a final thrust up. The grinding climb of the Wall of Worry that has characterized this market since 2009 will continue until a final, panic-buying stage sets in. We may be now entering it. From Yves point of view, so what; a tumble in 2014 will simply set the stage for more appreciation downstream. Two competing lomg-term views that share a short-term prediction. Enjoy Yves perspective. We are of course not surprised at the reaction of players who have missed the rally. They will spew any and all reasons for this market to crash. Yes, it will eventually encounter a degree of such devastation that we would rather keep our timing to ourselves at that moment. The gigantic money inflows was and is still the driver of this great move. There is more money on the way. It should be showing, as we have repeatedly explained, an exponential tendency. We model interest rates for the next 15 years and believe that savings will never carry an explosive growth path of debts. Forward looking the gap will only increase faster. This spread in turn will pressure bonds lower. It will wipe out a generation of bond only buyers or what we see as income oriented investors. People argue that stocks will rise as the economy performs better. We are not of this school of thought. We object to much improvements going forward for developed markets. Our behavioral work distinguishes between losing assets and winning ones by carefully tracking shifts in sentiment, which fundamental analysis disregards. Being long the euro currency this year best exemplifies this kind of approach. Two recent shocks over the last decade have profoundly shaped the perception of investors. This has forced a re-balancing of assets in favor of income. This is coming exactly at the heels of the greatest acceleration of debts worldwide. I did use the word crushed in an appearance on Yahoo Finance to describe what was at stake for bond investors. We will not sugar coat our language when it comes to interest rates. We have tried to shock portfolio managers in presentations this year. We can only describe the level of apathy we have seen as unbelievable. This is what a 30 year bull market will do to public opinion. Our bullish stance has been validated this year with great returns. We do suspect that we are heading for a rather tumultuous 2014. We think it is a bump in the road. Our forecast for the Dow to double from next year's low point remains compelling. As long as the market climbs a wall of worry, we will climb profitably with it. Unemployment rate up but numbers of new jobs higher than expected. This could signal more workers trying to find jobs (optimism) hence the unemployment rate ticking up is bullish. In the oddball world of BLS numbers, with adjustments, the actual number of employed dropped this past month, but the adjusted numbers are higher; experience has shown that readjustments made next month will give a better picture than the numbers today. But for today, a bullish signal. From the site: "Lines B, C, and D are parallel trendlines based on the lows highlighted via the green arrows. Line C intersects with Line A near 1,280, providing a possible strong level of potential support. In terms of upside, Line D says 1,425 to 1,440 remains possible." I hold by the view of a final move up to the 1500s, likely getting close to or at new highs, a triple top of the 1550-ish level hit in 2000 and 2007. I now see other pundits joining in. All About Trends also gave a Long Side Trade Trigger Alert this morning in some specific ETFs, and is expecting the same for the S&P, given the retest of the 1292-1296 level and bounce off it. A lot of other wave bloggers report a break in the down channel, which is causing them to hustle into alt counts. Easier just to see the downtrend as ended. We shal see over the next few trading days. Prechter has released his recent Elliott Wave Financial Forecast for Club EWI members for free. It is of course über bearish, giving a plethora of reasons for a coming major decline. It is certainly valuable to peruse, particularly around the European contagion echoing history both in the 1930s and the 1830s, the first Great Depression in the then-new US. The EWFF makes a nice comparison between how Biddle's Bank of the United States and the Bank of England tried to stem a tide of bank failures between 1835 and 1839 and the Fed's similar efforts today. They both gave up in 1839, and we had a severe drop into 1842. Where I see the major difference to their view is the Euro contagion today is first leading to capital flight to the US, which is showing up in bank runs in Greece, Spain and Portugal; and a rise in Treasuries with the ten-year yield getting down towards 1.7%. This capital fight to US assets should spill over into equities, hence help drive a final run up in stocks. A lot of the doom-and-gloom Elliott Wave crowd were expecting it to break, confirming (in their counts) that the long-awaited and dreaded P3 wave down had begun. If we had broken it, the rally since last October would no longer be countable as an impulse wave since wave 4 (the current wave) would have breached into the range of Wave 2 (the wave after that 1292 peak). If we now hold above, the current wave since last October looks like a classic C wave, which breaks as an impulse in either a Flat or Zigzag correction. If this holds, we should expect my predicted final leg 5 up to new highs (since 2009), and a Triple Top at SP 1550 +/- (going back to the peaks 2000 and 2007). If this leg 5 mimics leg 1, it should run for about six weeks and go around 220 points, putting it above 1500. Structure isn't optimal, as we would have expected wave 3 to extend (ie go 1.6x wave 1 or 5). Also, historical patterns would point to a peak in August not July, to be followed by a September/October market drop, so this may run up more slowly than wave 1. The seasonal pattern has a general rise in stocks from November to May, and we are seeing the market so far conform to that pattern. Usually within it is a February correction, leading to a number of January Tops over the past thirty years. Sometimes that top marks a major reversal, as we saw in 2009 and 2000, but usually a month-long minor correction. Prechter has been predicting a major top now for the past two years, and a number of technicians have centered on a Jan 24 top prediction. Now, often these timing predictions when they work mark a change of trend, but it is often hard to predict in advance which way. The market is in an uptrend right now, and might continue as such into next week, when this turn window occurs. This suggests a reversal down, conforming with the seasonal pattern. It still might be a minor correction, however. EWI has released through Club EWI a series of charts for the public, which add an additional factor, the approach of the market from below of a major trendline going back to 1932. As you can see from the chart above, the Dow in the late '90s crested the upper trendline, which previously marked tops all the way since the 1930s, and stayed above until 2008. The drop in 2002 bounced from above off the trendline, indicating continuation of the uptrend. Since the reversal back up in 2009, the market has moved in 3 waves (a corrective pattern) to touch the bottom of the upper trendline. Failure to break through for more than a short time (a "false break") is bearish, indicting a fall down towards the lower trendline. Breaking back above and staying there is very bullish. This suggests the January Top could be a major one, but step back and consider the broader picture. At trendline tests, a "jitter" or series of tests is common, and we might see a triple top or triple test over the next four to seven months. A false break is tested over the time frame of the pattern, and this one goes back decades, so a period which might seem longish to us (seven months) is but a blip in the broader time scale. Hence it would not be surprising to see a test and a drop back - the February correction - followed by another test which might stay above the trendline for months - the typical bullish period of March to May at the end of the seasonal patern. If I can paint a scenario, we would then fall back in the summer and test one more time in late summer - the common August High before a serious Fall correction. It is with great trepidation that I post this, given my prior post, but the comments are overflowing & I wanted to give frequent readers a forum before you jump (or not jump) to "Mamma's" new place. Have at it, and as a treat a little technical analysis below the fold. The STU discussed their target levels today, as promised. Last Friday they had drawn a line in the sand at 1341, but curiously that has dropped from sight. Here they have one way to count which puts the 1341 stop out to 1346, and another which puts it in the 1352 area, where C = 62% of A. (Wave C from July 2010, wave A from the Mar 2009 bottom), with some leeway to get above 1360. In addition, we are nearing the upper trendline, which gets to 1339 on Friday, and may provide resistance after a brief throw-over. There is a lot more in this STU for those who are interested. This upper trendline is shown in this chart from Robin Landry. He put out an update, discussing two possible wave counts, shown in green (the near-term top count) and red (the very bullish count). He notes that if the Dow gets beyond 12444, then wave 5 would be longer than 3, and make 3 the shortest wave, which violates a core rule. Hence while he expects an interim top before 1244, he notes how the wave structure would turn to very bullish above that level. This was explored at length in Prechter's recent EWT as well. If we blast through that level, under these wave counts, expect this market to continue to run into 2012, and to approach the triple top at the 1550 level. This upper trendline may prove a line of resistance. It is indeed interesting that the 2002 low bounced off the upper channel and the 2009 low off the mid-channel. So are we at the critical juncture? Either we top real soon, or we shoot to 1500? And "shoot" is the only term to use; under the bullish wave count, we would be entering the most explosive phase of a bull market, the midpoint of the 3rd of the 3rd. This market would accelerate, rising at a steeper pace. A very common relationship in a zigzag is for A = C in length, which pegs C as stopping at 1361. So look for a pullback there. Curiously, if it rushes past that level, the wave would begin to take the shape of a five-wave impulse with an extended third wave. A normal extension is 1.618x, targeting a run to 1475 area before a wave 4 pullback. A normal wave 4 retraces 38%, putting the market back down to 1361. A wave 5 would follow, and again a normal relationship is 5 = 1, which would peg the end of this whole wave at 1550. Sometimes the time relationship is not A=C but A+B = C, meaning C might end around Feb 2012. Food for thought, but not honey for the bears. Right now the bears are sharpening their sweet tooths on their levels between 1334 (double double) and 1361. I still find it telling that very few bloggers bothered to mention this latest level to watch; it is as if the relentless QE2-driven bull market has caused a domino effect of capitulation across the blogosphere. This may be the most bearish signal of all! Capitulation precedes a peak. Back in April 2010, the petering out of Quantitative Easing happened about when the Flash Crash came about. At the time it was not generally seen as a cause, as everyone focused on the drivers of the Flash Crash itself; but since the rise of the QE2 market, pundits looking back have conjectured that the liquidity pump of QE is keeping the market relentless in its rise. This points to June 13 week as the next endpoint, when QE2 is supposed to end, unless QE is extended (the Fed has commented on extending it further out but at a lower level of intervention so the total intervention is still $600B cumulative). Given my prior post and comments being floated by Fed members about ending QE, it may be a consensus will form that QE will be ended prior to the official Fed decision. Recall that this market began rising when QE2 was announced in late August, not when it was actually started in November. It may peak when the end of QE is clear, before QE actually ends. It is not clear that will be the decision right now, as these Fed member comments may be in the nature of planned leaks to test the market waters, not signals of a policy decision. More likely a decision will be driven by economic data, and in particular an acceleration of recovery (if that is what happens) and more signs of inflation. The inflation data may be clear by mid March, and the economic signs may be clear at the beginning of May when Q1 GDP is announced. Thus suggests the danger zone begins around the vernal equinox (Mar 20), skips across April Fool's Day, and extends into May Day. Will 2011 follow the same pattern? Is Peak Optimism Giving a Sell Signal? Earlier this year investors were too pessimistic. Now their breezy confidence seems misplaced. This suggests that the Fed's QE2 and euphoria over tax cuts and FICA holidays are up against a rather overbought condition. The Friday STU continues with a whole series of extremes & inter-market divergences, worth reading if this drives your trading decisions. While they don't peg a level for the top, they say at current levels it satisfies normal relationships - for example, the S&P is slightly above the 62% retrace of the whole drop in 2007-09. Some bloggers have fixated on Sp1246, where this final wave 5 is 62% of wave 1 (of the C wave that begun at the July low of Sp1011). Other relationships could emerge, such as 1291, where wave 5 would equal wave 1. Bears continue to get firehosed by the infinite fiat spewed forth by "The Ben Bernank"
He points to the lack of full retail participation in the market, which normally accompanies a top. Indeed, the small investor has been steadily abandoning this market rather than piling on, not normally a characteristic of a bull market either. So his indicator could be used either way: not a top, or not a bull. Precious metals remain on a tear but also may be hitting resistance. Silver has been phenomenal since the late August confirmation of QE2. It has risen above $30 and breached a long-term resistance line, suggesting a pullback over the next week. It had hit that line in early November and fell hard off it, before continuing back up. If stocks reverse hard here as well, the STU believes this might mark a long-term top in silver. Of course, they have been bearish silver and gold during this whole rise. They think gold too is at a top, as the USD seems to be on a tear itself, and normally Dollar strength would result on Gold weakness. When QE2 was pre-announced at Jackson Hole, the market took off in the September-to-Remember rally. The fundamentalists touted its advantages to keep rates low, spur stocks to rise, and improve the economy via a cheap Dollar; they also anticipated a Republican victory in the mid-terms. When the election happened as expected, and QE2 was formally announced, markets began major reversals. Was this simply a matter of buy-on-rumor, sell-on-news, or something more? Fundamental analysis does little good at this point. After the reversals, the fundamentalists changed their tune: QE was ineffective, was leading to currency wars, was driving rates up on inflation fears, etc. Interesting enough, the market experienced a big triple-digit rally on Thursday that carried the S&P 500, Dow, and Nasdaq back up almost to their 21-day moving averages in one day. But the rally stopped just short of those resistance levels. So the question is still out there. Normally, market analysts would not be focused on such short-term considerations. But a situation is also in place that might have intermediate-term implications, thus making how the market deals with the short-term support and resistance levels more important. Wave Theory is most useful at these points, to give guidance or at least signposts as to what comes next. Since technical analysis is probabilistic, this guidance is odds-adjusted. Some calls are high confidence, others are low. At those times, best to make no calls at all. Prechter in his monthly Theorist concurs with Sy Harding that this could be the start a something big, although the better odds are we make one more run at the 1227 level. He has been on an All-The-Same-Market view for a while, that global markets are linked, primarily to the Dollar. He lays out a convincing case that global markets all topped and reversed between Nov 5 and Nov 10, as the Dollar bottomed. At that time bullish sentiment hit extremes typical of a top. Neely has called for a new short position, with stops, indicating high enough odds for a drop from here, although not a major move down. The STU sees two choices, and believes how the market opens on Monday will provide a huge tell as to direction over the next few weeks: will it turn down and break below Sp1173, indicating a deeper correction, or continue up back to the 1227 range, indicating a sideways move? Fractal Finance also provides a useful description of the past three months. Markets are order-seeking mechanisms and when they find order they move quickly in a thrust, anticipating the future gains before they arrive. When they reach the limits, they pause to seek order again, driving the market into a sideways move which can often seem volatile. The reversals we have seen so far are the choppiness from being on the edge of chaos, seeking order. The market spiked up to 1227 and came back down into a prior trading range, but has not yet bifurcated out of the range. This suggests a period of sideways motion. The bifurcation out of the range will be the confirmation of a new thrust beginning. They usually come after a triple test of the top or bottom of the range. Pulling back to the larger picture, we have a much larger plateau that stretches back to January 2010 (and arguably even farther back) and so far has had two tops at the 1220 level. A third test in the 1220-1235 range would be expected, although not required. Prechter thinks it will come in January. Sy Harding would have expected it in May under the normal seasonal pattern. Let me marry wave theory with fractal finance. The move up since Jackson Hole seems to have ended at 1227, but the not the whole primary wave since the low in July. The recent top likely only reflects an end of wave 3 and we are now in a wave 4 with a higher high ahead above 1227 in wave 5. If we break below 1173 on Monday, that indicates a sharp correction characteristic of 1227 being a major top (although it doesn't confirm it, just increases the odds). If instead we move sideways, that suggests that we are in a wave 4. If we count the action since the low in July as the primary wave, wave 1 (red) went up for six weeks into early August, and wave 2 (red) fell for three weeks into the end of August. Wave 3 (red) ran up for over 7 weeks into mid-October, where it started a plateau. That plateau was a short sideways action that didn't retrace much of the prior wave, which makes it more likely to be merely a minor wave 4 (blue) of wave 3 (red), and not a major wave 4 (red) of the primary wave. The subsequent spike up to 1227 was also relatively short and brief, again making it more likely to be a minor wave 5 (blue) rather than a major wave 5 (red). We can also count the rally as done, with barely discernible fourth and fifth waves, like the last rally into 2007. But on the basis of form, this must be considered an alternative interpretation. A number of traders like to fade the most popular bear, Bob Prechter, and thus are waiting to see how his monthly service, the EWFF, explains the new highs. Rather than turn into a latter-day bull, the EWFF remains firmly bearish, but had to jump through an analytical contortion to get there. They now see the Hope Rally as a large ABC zigzag with the first leg running all the way to the April highs. In a zigzag, waves A and C break as impulsive five-wave structures. In order to get there, they had to concede that that wave A was a five-wave move even though they admit it lacks a clear five-wave structure in its impulsive waves (1-3-5) and lacks alternation in its two corrective waves (2-4). Tony Caldaro should be smiling, since he was the first major wave analyst to call it that way. The mea culpa from the EWFF is "there are times when lower probability outcomes occur, and this was one of them." Somehow this is very unsatisfying from what normally are tough analysts. In contrast, the third major wave analyst, Glenn Neely, has stayed true to his methodology. He has a different wave structure for the Hope Rally, where he ends the first wave up a year ago amidst that choppy Sept-Nov action, calls the Nov-Feb period last year a corrective X wave, and counts the action since as a large corrective pattern where wave A went to April highs, wave B is the flash crash and its aftermath, and we are now in the final wave C. He thinks odds favor a short right now. No ewaverer he. Interesting is that both major pundits are coming to a similar near-term outlook. 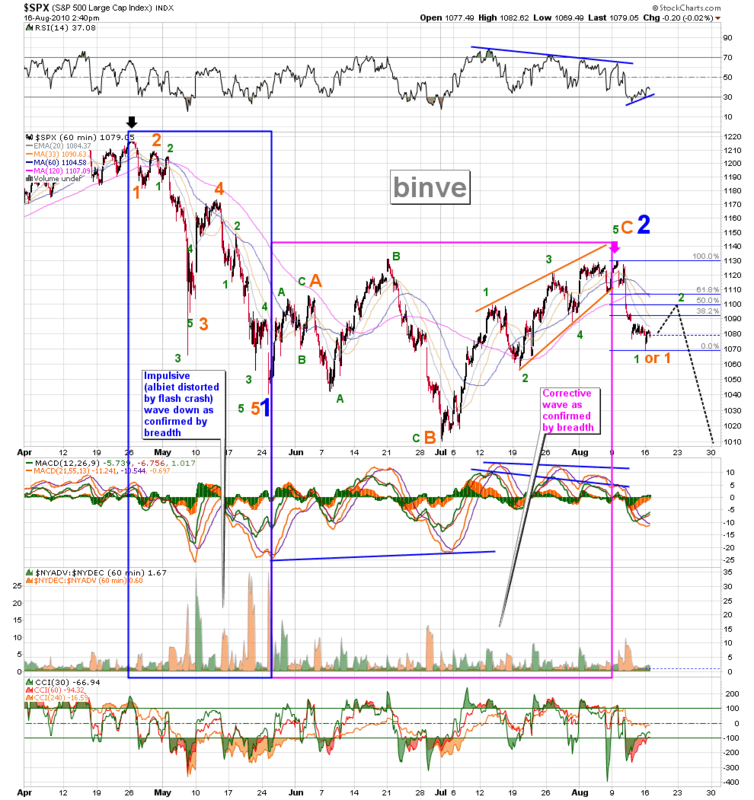 Neely expects a down wave 4 and a final up wave 5 to complete his C wave. Prechter sees wave A ending in April, wave B ending at the July low of Sp1011, and wave C has breaking so far as a 1-2-3 pattern where we are in 3. He too thus is looking for a wave 4 down and a wave 5 up to complete the pattern. He leaves open an alt count where the July low is but wave (a) of B, and we are in wave (b) of B with a (c) to go. This might get confusing with all the waves but it implies that after the little waves 4 and 5, we have a correction to Dow9500 and then a final rally. Martin Armstrong, still in jail, has restarted his own market numerology, which pegs a major turn point to June 13, 2011. So far all the wave prognostication has prematurely called tops. Perhaps Martin's date will be closer to when the Hope Rally truly fades. How should contrarians play this? Turns out the net bullish sentiment (bulls less bears) is at its highest of the whole Hope Rally - indeed a three year high (ie since the 2007 top). Futures traders are 94% bullish, the highest since January 2007. How much upside is there when bullish sentiment is higher than at all prior tops, including the all-time high in 2007? My take: continue to watch the Dollar. It broke below the three-year support level yesterday, but has come back above. The bullish case in stocks is based on a bearish Dollar. A Dollar bottom reverses all the recent trends driven by belief in QE and the Bernanke Put. If it remains above it may have put in the bottom. The market has settled over the trading range and seems to have Sp1174 in its sights. In a Fractal Finance view, by closing above the trading range (1130-1150) and staying above, the odds are favoring a continued bullish break up. The 1174 level is an important one, since it represents the 'fourth of the prior third' (the big bounce right after the flash crash went all the way back to 1174). Tonight's STU notes how this is the most common retracement level. This level is also the 78% retrace if we count from the July low (it is 1181 if we count from the May25 low). The 78% retrace is the last line of defense for the bears. Above the 1174-81 levels, and it is difficult to maintain a bearish posture under wave theory. Now, in a thrust up sentiment levels can remain extreme for a while, so hitting such levels is not suggesting a quick reversal. It does suggest, however, that when the reversal comes, it will be sharp and unmistakable. When fundamentalists win both sides of the argument, contrarians get ready to fade their position. Put more prosaically, if the market anticipates the win-win, it will rise on the rumor. So sell on the news. We are right at the Oct5 turn window. As the market continues longer in its trading range, the odds of a top increase. We are closing on the point where the rise from the beginning of September to now becomes slower than the rise off the July 2 bottom. Let me run through a series of charts with a discussion of whether we are in a topping period which is about to end. Carl Futia draws trendlines around this range in the e-mini and predicts a drop to the lower trendline (es1127) followed by a bullish bifurcation up. In a Fractal FInance view, the market is an order-seeking mechanism which runs in a thrust when it finds order, then pauses in a plateau as it seeks the next level. After the Fed's late August meeting where QE2 was made more likely, the market thrust up over three weeks then paused at 1148 on Sep22 and has sat in a trading range between 1150 and 1132 for the two weeks since, with one false break below to 1123 and another above to 1157. We have hit the upper range four times, and failed to break through on the fourth try. In a chaos theory sense, energy is now leaving the system. The STU tonight goes farther, and points out that the Nasdaq 100, which includes the most important Naz stocks, has closed at its lowest level in two weeks. Could be that the tech stocks, which have helped lead the September to Remember charge, are now signaling the October Surprise. The most important bearish indicator is in the Currency Wars: the Euro has now hit a level which the STU highlights as a "beautiful picture" of relationships for a top in the Euro. At an overnight $1.38, it has retraced 61% in both time and price from the April low of $1.19, and is right at the fourth-of-the-prior-third level (of the extended first wave down off the $1.51 high in 2009), a common turn point. With only 3% Euro bears, sentiment favors a turn. The change in the Euro's fortunes will of course reverse the Dollar's slide in the Dollar index, where sentiment is also decidedly ready for a turn, with only 5% bulls. Neely also favors a turn down in stocks. Neely sees us in a bullish wave up, but in need of a deep corrective wave. He has been counting the whole move off the Feb5 low as an ABC corrective pattern, with the A wave to the April highs, the B wave to the end of August, and the September to Remember Rally as wave 1 of the C wave. Time and price suggest a reversal here and a deep drop of at least 50-62% of the rise, but not to new lows and not below the lows at the end of August (1040). He speculates that wave C may take the form of a Terminal, which in orthodox wave theory means an Ending Diagonal - a five-wave pattern that breaks as an ascending triangle. The Bears Are Looking Excited - About 1939! The pattern of five waves down and three up is clear across many indexes. This sidebar chart is from Daneric. (Click to make it larger.) The level reached today - 1157 - is right at 1158, a favored target of many bears, where the September to Remember C wave would travel the same distance as A wave from the July bottom to the August top. The time is slightly shorter than the STU turn dates from this morning's post, but fit the STY target of 1158 as well as the Gann 90-day rule between the July bottom and an Oct 1 top. The gap up and reversal is the signature of an exhaustion gap - a gap at the end of a strong trend which reverses back below. The September to Remember rally is the best September since 1939, and one of the best rises for any month - qualifying as a strong move. You can go down a list of additional technical indicators that point to a top here. Now, that other September to Remember is really remembered for a different reason: Hitler invaded Poland, kicking off World War II. It is fair to say the world conditions are quite different. All we have going on besides our Imperial Adventure in Afghanistan is a brewing Currency War between China, Japan and the US. Not the stuff of legend, nor even worthy of a Hitler Video. I have been tracking whether the break this week was a False Break that would be rapidly reversed or a Bifurcation up to 1174. When we fell back into the trading range (below 1128) yesterday, it raised the question whether the break above was a false break, but I added the cautionary note that we have to remain below or it did not change the prior view of a bifurcation up, just raised a warning flag. By going back above it removed that flag. Amidst a lot of bearish angst, we now have a bullish prediction beyond what is flying around the blogosphere - I will save that for the end. Today's STU also focuses on currency reversals. The Dollar Index (DX) broke through a trendline from the Nov 2009 low at 74.17 through the Jul 2010 low at 80.09, and fell hard for the last two days to below 79.60. We are down to 8% Dollar Bulls, similar to the 7% lows of those prior two low points. Ben's QE2 is working black magic, killing the Dollar as it props up the deficit. Watch for a DX reversal as the signal for a top in equities. It is informative to scan the many ewave blogs to see where the bearish consensus is herding to: Sep30 or Oct1, the next Gann spot, at 1158, which strikes me as a bit low. JT, a reader, left a concise comment that if the Flash Crash down ended on Jul2 in a leading diagonal (LD) formation, the expected bounce should go 78%, or to 1174. You might expect that EWI would agree, since Prechter wrote the book on that relationship (78% retrace after an LD), but they do not see the drop as an LD. Instead, the Friday STU sees the gap open today as a classic thrust out of a fourth wave triangle, which means it is either spent or will be slightly above 1150. AllAboutTrends calls this a Climax Run, pointing to the negative divergences in the RSI vs the retest of recent highs. They too think it is about spent. MarketThoughts speculates that we may have had a small ending diagonal (ED) today, which means we should gap down Monday. They urge readers to watch the Naz, which now seems to be leading the other indices. So the bears have their story and they are sticking to it. Fractal Finance says after a trading range, a bifurcation occurs. If we run up strongly, that indicates we are bifurcating up. Always watch for a False Break, but they have to reverse fast back into the range. We had a False Break to the downside on Jul2, going below the 1040 level, but came right back into it quickly relative to the time scale of this trading range (now four months and counting). It could be we reverse back down - this might have been a last gasp today - but if not the bears have to wrap their positions around a bullish case. Neely plans to issue a report next week arguing for the bullish run. We shall see how Monday and Tuesday run before he launches his view, but he gave me permission to preview it. Punchline: we may exceed the April highs in late 2010 or early 2011. The C wave began on Sep2 and should break in five waves. He has gained confidence in this count because the C wave so far has run faster than the prior wave from Jul2 to Aug9 - this indicates a change of trend. Wave 1 of C is nearing an end, which creates an utterly stunning Bear Trap: wave 2 of C should soon start, and drop 50-62% of the rise (or back below 1100), encouraging the shorts. Then wave 3 up towards new highs. Seasonal timing would give us a poor October followed by the normal November - January rally before some Feb weakness. Key factor to watch: if this wave up begins to plateau from here, as it has for a week, it would slow the ascent. The inside b wave ran from 1011 to 1129 from Jul2 to Aug9, or 38 days. If this one stalls below 1158 beyond Oct9, it would have slowed too much. Hence it is likely that wave 2 starts pretty soon, likely by end of this coming week. Final comment: I do not have any affiliate relationship with Neely, but do get a complementary subscription. I have noted a number of times that his trading service is much more actionable than others I follow, and he is willing to stay with predictions that go against the ewave herd. If this begins to play out his way, you might check his service out. We have now closed back within the big trading range between 1040 and 1130, and right on the predicted turn window of Sep23. This makes the recent pop to 1148 a False Break if we remain below. This would mean the Summer Rally is over. It is too early to definitively make this call, but the odds have increased. Molecool over at EvilSpeculator is pimping his Zero indicators, which I must say look pretty impressive. Mole may have created a new and useful indicator. To be watched. Zero is NOT pronouncing the end of the Summer Rally. Bob Bronson had predicted a top between the autumnal equinox (now) to the end of the month, and believes it is in today. He also points out that leading indicators are turning over, which makes the recent NBER pronouncement of the end of the recession quite ironic. Their contrarian timing is impeccable! Also, any return to negative growth will be an official double-dip, as we have now come out of the first dip, even thought we never got back up to where we started. In the double-dip of 1980, we came back up then fell down. In the original double-dip in the 1930s, we never got back up before falling again. Scan some of the bearish sites and you will see shock and dismay at today's rally above the 1130 resistance level. As they topple and capitulate, it is almost time to call the top. Fractal Finance is being stressed, as it needs this break above to come back below 1130 by the end of the week, but my timing of the autumnal equinox (Sep23) is looking plausible for that top call. The nested 1-2 count of EWI is blown, and they have a new count: a double correction, which they describe in their tutorial (free) in lesson 5.1. The implication is this is wave C of a zigzag off Jul2, and while the STU gives other targets and a deeper analysis, typically the C leg of a zigzag goes the same as A, which in this case is 1011 to 1129, so it should go from 1040 to the 1158 range (say, from 1151, the Jan top, to 1174, an interim top in the Flash Crash). Fractal Finance is now 4-0 over orthodox wave theory, but before it can notch the last win, this needs to turn into a false break. Neely, lying in the weeds all summer long, is comfortably in his prediction of this rally, but curiously is urging readers to stay out as he doubts the staying power. Even the bullish Carl Futia sees the market as still overbought. Midday today he expected churn around 1127 before a run to 1174. The pattern is pretty clear in the Dow, although not textbook. The implication is the thrust should go about the widest part of the triangle, or 100 pts, targeting Dow 10640. Curiously the S&P lagged and has not made a new high (above 1130). Its target sits right at 1130, completing a triple top back to the August and June tops. In this view, the current wave we are in, leg e of the triangle, can end any time, although given the structure of the triangle (a barrier triangle with a resistance line at Sp1125-30), it remains most likely we get back up in that range before we complete the pattern. This triangle also appears in most other indexes, including the Wilshire, the Naz and the RUT, although notably not the Dow, which counts instead as a double flat, with the June- to July drop an X wave, which means it might go slightly higher than the August top before reversing. What happens next I will discuss below the fold. Was Last Week a Buying Panic? The wave structure is at the 2/3 retracement level - a bit higher than normal but at one of the Fib levels - and also can be counted as a five-wave C leg ie. complete. It would also be reasonable to count the flat trading range of the last few sessions as a wave 4 with a final wave 5 spurt up. The next retracement level is the 70.7% "repetition" level (half the square root of 2), a level not noted in orthodox wave theory but found to be useful in Zoran's work. The S&P rode to that level today (1103). The STU tonight had a good discussion of all these points, plus added a counter to the pundits who loosely claim that there are too many bears for a top to be in. It is one of those parenthetical discussions which make the STU useful to cut through the noise of casual blather on market conditions. They note that at real market bottoms, bears overwhelm bulls day after day (they give examples), whereas in this case the days when bulls outnumbered bears has been decidedly more bullish than bearish since last November, when we first hit the levels we are now at (from off the March 2009 bottom). Good stuff. Funky month-end close-out spike yesterday, bears cry foul! This has gone all all summer and we are still stuck in the middle of a trading range from Sp1040 to Sp1130. A C-Cup sized range to be sure. Let me try to put this in perspective. In a Fractal Finance view, a trading range reflects the entropy (uncertainty) after a strong move. We had a pretty good move in the Hope Rally, from 667 to 1220, or 80% in 14 months. From the perspective of the huge drop off the 2007 peak, we came back 62%, a normal type of retrace, but overall still a large move in a shortish time. At the bottom in 2008, we went through four months of consolidation in a trading range before the Hope Rally. We have only been through three months of consolidation since the Flash Crash off the top. We are also in the unfavorable season for stocks in general (May to Nov). Point: consolidation should not be a surprise. I have my fourth preseason test of Fractal Finance vs Wave Theory underway. Fractals predicted a bounce to at least 1074, and we got that in one day. Waves predict a fall early this week, and we are hitting the outside limit of "early", so they need a drop to start tomorrow. It is, however, too soon to claim a fourth win in a row. The wave count from the STU is a nested 1-2 off the Aug9 top, and while it got squeezed today, it is not busted. More on that below. The biggest cause for concern is that uncertainty is increasing. In Fractal Finance, uncertainty means a trading range, but if the consensus shifts too negative, the market will lose its support and begin to seriously sag. The uncertainty is centered on the faltering recovery. Obama's "Recovery Summer" is a bust. Many believe the Fed is busted, too; but while Bernanke may be out of bullets - he is not out of bombs, which he could drop from his helicopter. The uncertainty is also political. If the Repubs retake the House, we are in for policy deadlock plus investigating committees nipping at Obama's heels for the next two years. The uncertainty is also about future policy jiggles. It is not evident that Obama will triangulate as Clinton did in 1994; but he might. You can see op-eds emerging that say we have nothing to fear but uncertainty itself, and it is probably time for the government's final recovery policy to be launched and then left in place. Fiddling begats further uncertainty. Econoday notes that there was still some concerning information in the result. “Lagging factors gave what is a bit of a deceptive boost to the ISM's manufacturing index masking a further slowing in the key leading index of new orders,” the firm said in a report on its site. Specifically, new orders slowed to there [sic] lowest point since the recovery in manufacturing began in the second quarter of 2009. UPDATE: Rosenberg is out the next morning with his take: Yesterday's ISM Was Likely Wrong, To Be Revised. Key point: only 1% of the time is ISM up when the three leading indicators (new orders, backlog and deliveries) are down. He also found the decline in exports - when "the overseas economy is rocking and rolling" - disturbing. He concludes with the observation that in the past 30 years, ISM dropped to 47 after a decline like it has in the order/inventory ratio. Autos are reporting right now, and are down a lot year-over-year - albeit last August was skewed by Cash4Clunkers - and are also down month over month. They are likely to miss expectations. The WSJ headlines: US Car Sales Plunged in August. Does this forebode a poor Sep as well? Or was this a panic/exhaustion day? The STU count maintains a nested 1-2 down, but there are problems with that count, The outside 1-2 should be longer (in time and distance) then the inside. In this case wave 1 fell from 1130 to 1070 or 60 pts, and then bounced to 1100, or 30 pts, a 50% retrace. The inside wave (i) bottomed at 1040, or also 60 pts down, and so far has bounced to 1081, or over 40 pts - more than the outside wave 2. We have reversed 62%, which is enough for this to be done, so they hold to an imminent drop. But I see the nested count as already suspect, and expect it to be fully busted, which happens if the inside wave (ii) breaks 1100. Interesting is that the STU leads tonight with their 2008 comparison I showed over the weekend, and followed that with a fractal comparison to the current pattern and the larger flat from May25 to Aug9. The fractal suggest a reversal down, but the 2008 comparison suggests a continuation to retest the Aug9 high. Uncertainty. It is possible to count the triple bottom as containing a small degree waves 4 and 5. It is also possible to count the first three waves down as five waves, given a small 1-2 pattern to kick it off. In both those cases this would be a wave 2 back up, and it would be at the normal 50-62% retrace at 1084-1095. But in general the best wave count is the simplest, and that has this as three waves down. While the prior chart points to 1100 as confirming a three-wave pattern, it is simpler than that: this wave has already gone into the territory of wave 2, so cannot be a wave 4. What if this drop is a "3", meaning corrective? How bullish is that? Neely counts these waves as a double flat (abc - x - abc), and he anticipates a rally. He was calling for the turn of the month to be the turn of the waves, and he (so far) got it spot on. His count has the whole drop off Apr26 as a larger B wave, and he now thinks we are beginning wave C back up. Wave A began last Feb5 and went from 1045 to 1220; wave C starting at 1040 would go to 1150 if the C wave equaled 62% of A (a normal relationship); or to new highs if C = A. My take: whether or not we fade back tomorrow (common after a strong move) and then have weakness after the unemployment report Friday, I expect a continuation up to at least the 1087 area if not a runback to 1130. Fractal Finance requirements have been met with the move today, but in general would expect the larger plateau from May25 to now to complete with a triple top around 1130. I posed a simple test between Wave Theory and Fractal Finance last night. This is the fourth such test in the past few weeks, and so far fractals are ahead 3-0. Call this the preseason. The test is whether we have begun the dreaded P3 wave down to new lows, or have a sideways market for the next few weeks. The key is whether we break Sp1040 in short order, and stay below, or meander sideways. If we break above 1130, both lose! If this market is about to rally as I expect we should see strength above the 1050 level early tomorrow. Failing that I think a further drop at least to 1025 and probably to 1010 will be the next development. I have not mentioned Neely's views much recently, but it is worthy to note that he thinks we are about to rally. His model has us in a B wave since the Flash Crash, which is about to end in time and price, and it should be followed by a C wave rally. This pattern began on Feb5, with the runup into the April high an A wave. He thought this B wave was breaking as a triangle, but it seems to be better counted as a double flat. He is the most bullish of the wave theorists right now. If we break 1130, where both orthodox wave theory and fractal finance would lose, Neely could be considered the winner. The Fractal Finance near-term view is a sideways move, and this drop is part & parcel of it. Interesting is that a sharp False Break below 1040 followed by a Labor Day Rally would be consistent as well if the drop and bounce is fast. Hence watch whether we continue down on increasing momentum, or slink sideways into Sep, which suggest a run up above the recent plateau into at least the 1074 range if not higher. Lots of economic news this week, and it is the last week of vacation season. The market is normally somewhat positive into Labor Day, and quiet; but we are seeing fireworks on forex markets due to Japan initiating a new round of stimulus. A sideways move should not surprise, and it may be accompanied with an increase in swings in global markets. This sort of ambiguity is part and parcel of wave theory, and can be very off-putting, so let me see if Fractal Finance can give better guidance. So far it has bested wave theory in the last two tests. The trading range to the left of his ovals from Aug12 to Aug17 is the "plateau". Carl's first oval circles where we popped above and came back down, which confirms it as a false break. The second oval has us below range of the plateau, then back into it, and now below again. If we do get the small c wave, it should not go above the top of the recent range, or Sp1087. But can we improve the odds beyond that? Hence Fractal Finance is predicting a gap down this morning as the start of the next thrust down. I wrote this post Monday afternoon so as not to sneak a peek at the morning futures for guidance. Let's make this a fair test. A lot of pundits are watching around 1060, but 1041-45 is a better range to watch, the level of resistance since last Feb.
Summer doldrums, very low volume, and no conviction - except among the punditry, which expect a short term bounce. The pattern under Fractal Finance is pretty clear: we had a rise in July into a trading range, bifurcated out of the range & have stayed below, indicating a change of trend, and settled into a new trading range. The market was range bound for the past few days, but spiked below and came back above today - a false break. This suggests a break to the upside, to be followed by a drop. This chart from EWP is pretty consistent with all the major ewave sites today, including Daneric, Kenny and MarketThoughts, whose chart for the past five months I recommend. The bifurcation out of the range around Sp1110 and 1128 is pretty clear, and it had now fallen in a five-wave pattern with a strong third wave down. This is also how the STU counts it today. Typically a minor wave 2 bounce goes 50-62%, which suggests an outside level of Sp1106 (Dow10525). The gaps at Sp1189 and Dow 10380 shoud be filled on the way back. The economic news has trended towards poor, so it is being watched closely. The next two days have reports which could jink and jive the market. The bounce today off the false break (labeled wave 5 above) is not itself compelling as a start of a wave 2 bounce, so the STU warns of a possible retest or drop lower. The Fractal Finance model says otherwise - the false break is done for now. We shall see which one gives better guidance over the next two days. Overnight futures are down, although this does not always presage how the market opens. Hank Wernicki at Elliott Fractals nonetheless sees a hard drop Wed after the Fed's punt Tues. The market popped a bit on the Fed's announcement, then tanked into the close. An interim EWT went out tonight evening giving reasons why the rally since the Flash Crash is likely over. Well worth a look. The most interesting observation in the EWT is that the pattern of the past three months matches the pattern in 1987 between the Aug25 last peak and Oct2, two weeks before the crash. The USD seems to have found a bottom, and has moved sharply up since last Friday. Mr. Bond, as David Rosenberg is want to say, is also signaling a stock drop. Rosie points out that when bonds fall as much as they have since April (down 120 bp in the 10-yr), a stock (and economic) downturn follows. Does the Market Have a Final Twist in Store? The market topped on my turn date, August 4, but after the poor employment report, had a sharp drop that was not made up by the close today. Technical indicators are waning, such as declining volume during the up move from the past month and the lagging of more speculative indexes (Nasdaq, S&P small cap) to the major indexes (S&P and Dow). A very clear head & shoulders has formed between the January shoulder, the April head and now the August right shoulder. Interesting is how evenly spaced it is - the time from the right shoulder to head, and head to next shoulder, is almost identical. Most telling - and all over the blogosphere - is the wedge pattern in the recent market rise, an ending diagonal, which I showed several days ago. Even the STU now accepts the ending diagonal pattern. All of this increases the odds that a top is in. Supporting the case for a bullish breakaway is the new high in the NYSE cumulative advance/decline line. This case gets dissected in Trader's Narrative: there are a lot of non-operating entities in the NYSE, and the S&P does not show the new peak. The percent of stocks above their 50 DMA is at a high level (75%), but not at a peak; this is usually bearish as it is hard to sustain - unless the market is in a bullish breakout. Next week should be interesting. The bulls need the breakaway or their case gets swamped by the increasingly bearish technical indicators, and yet the apparent start of that breakaway may be the false breakout of the ED throw over. Today was my turn date, which means a top this week.This might be it, or just an interim stop before we get back to the Sp1150-75 area. Turn dates are chancy things, and it appears to me that we have more upside, in part because I think we get back to Sp1150 before falling, and also because I expect the Dollar to reverse at about the same time. It has retraced 57% of the rise in the Dollar Index, and should be expected to go a bit farther, to the 62% area, before bouncing. The stock top and Dollar bottom may resolve this week. Friday has the unemployment report, and it will be watched for guidance on the economy after the mixed GDP report last Friday (which is likely to be revised down from 2.4% to 1.7% given poor news on durables Monday). The STU thinks after the 8:30a pronouncement, market sentiment may break, beginning the fall. As you might expect, the STU thinks the top is nigh based on wave structure. This chart excerpted from Daneric shows the recent pattern: a triangle fourth wave and the fifth wave thrust out of it. The thrust has gone back to 62% retrace in the Dow, but is below that in the S&P. A thrust the width of the triangle is normal, and targets near 1140, which is the 62% retrace given a bottom at the low point (1011 on Jul2). In my Big Tease count, and the STU count, the low point is May25 at 1040, giving a target of 1151. Look for a thrust to 1140-1150 range in the next two days. The STU also comments that each move up since Jul2 has broken in five waves, meaning they do not see this as a triangle formation, nor an ending diagonal, with one exception: the Nasdaq had a clear overlap of waves 2 and 4, and has fallen behind the Dow and S&P, compressing into a fairly clear wedge. The bullish view is best expressed by Carl Futia, who brings out the Three Peaks and a Dome formation. The next two charts show the formation and the current count of Carl. The implication is very bullish: the market should now run up above Sp1200. This gives a good contrast over the next two days: an impulse up that crushes through the 1140-1150 level supports the bullish case, while a sharp thrust that stops in that zone supports the near-term top view. It is passing strange when market pundits converge on a common point of view from very different directions. The wave theory punditry & blogitry have been all over the map, but now are gaining conviction over a near-term peak in August, maybe within a few days of my Aug4 turn date (ie. this week or early next). The market has been in the Big Tease, which is working maximum damage on bull and bear alike, and pushing the pundits to the precipice. Today was the bulls turn to get momentarily exuberant. Will swimming against the bullish tide pay off for the pundits, or are they all about to tumble down the wall of worry into the abyss of irrelevance? Neely has been saying how in the middle of a formation, predictability is the lowest. He has had the market in a final corrective pattern since the Jan-Feb drop: an A wave to the April peak, and a B wave which is breaking as a triangle. We are now in leg D of that triangle, and predictability has increased, as has his conviction that the D leg will end soon and the market reverse down. The STU got prematurely enticed by the S&P futures overlapping waves 4 and 2, and expected August to start down. No mention of that today. Just as well - the futures do not lend themselves to wave theory as well as the cash indexes since they expire, and that distorts the picture. The Dow did not have that overlap, and although they saw it in the S&P cash, over common time frames (eg. 15 mins) I saw no overlap, it was the slightest of overlaps (1088.9 vs 1088.1). They have us in the final thrust up (wave 5 of V of C) and note that we are at the 62% retrace of the whole drop off Apr26. Wave 5 could be done; or could have gone only to inside wave 3, so has a bit more to go in inside waves 4 and 5. Robin Landry has a similar view, and expects a top in the first half of August at below Dow10800. He sees the wave count as complete today, just as the STU does; but allows for the final jink and jive of little waves 4 and 5. So three of the major pundits come to a similar view from very different places. The blogosity of ewave sites has also converged on another view with the same consequence: that we are in an ending diagonal (ED) C wave. This chart from Blankfiend shows the ED at the end of a wave count like the Big Tease: wave 1 ends on May25 and wave 2 is breaking as an expanded flat with a deeper bottom to the B wave than the end of wave 1. The ED is a clever way to get rid of the overlap of waves 4 and 2: in an ED, that overlap is expected. The final thrust up should compress, with 3 shorter than 1 and 5 shorter than 3, and converge somewhat to a point of lower highs and higher lows. So it seems to work, and you can see similar charts from Daneric, EWtrends, MarketThoughts, and others too numerous to mention. Market Thoughts gives guidance that for 5 to be shorter than 3, the outside level in the S&P cash is 1150. While clever, the ED has some challenges, including that all waves should be "3s" while the STU was adamant today that there are clear "5s" in the C wave, perhaps anticipating all these blogostic EDs. My Big Tease count has a different read on wave C: that wave (iii) of C is not yet done, and what is listed as major (iv) above is instead minor iv inside (iii). It is that minor iv which the STU was worried overlapped with minor ii inside what is labeled (iii) above. (The STU counts that (iii) as (v), having found a small waves (i)-(ii) inside what is labeled (i) in the chart.) This means we would be in wave v of (iii), and have a bigger waves (iv) and (v) to go. Such is the fun with wave theory! Hence the Big Tease is not limited by the ED short wave 5, and instead should go above 1150 in the current run up, possibly by Aug4; and then might get to 1175 later in August. Right now we have to see how the next few days go. ContrarianAdvisor gives another view, more in line with Carl Futia's "box" approach. I highlight it because it is also similar to Zoran's Factal Finance approach, of a "plateau" or trading range following a sharp thrust - in this case, after the Flash Crash drop, we have been in a two month trading range. This box analysis also predicts a top soon, after running back to the top right of the box. Zoran often expected a False Break above the box, then a drop back inside. Watch for either hitting the 1131 area and dropping, or punching above then falling back below. A Bifurcation to confirm the False Beak and the end of wave C would have to fall pretty sharply below the bottom of the box, or Sp1010. A final convergence comes from a reader and frequent commentator, DG, who has taken Neely's approach and extended it. He posted this chart a bit ago and I thought to share it with you. You can read his analysis in this comment. His work says the final leg of an expanding triangle, leg E, should end by Aug6, or the end of this week. August has marked notable tops, such as Aug25 in 1987 and Sep3 in 1929 (not quite Aug but close enough), as well as the last peak before the huge drops into Nov 2008 and Oct 2002. Since the recent end of the seasonal strong period was in April not May, it is possible that we peak early in August, not late; or even have peaked already at the end of July. Keep in mind that that these sorts of patterns are tendencies only. In 2009 August was choppy but did not mark a high. Friday's STU goes farther and highlights how we breached that level in the Sept S&P futures (ES), and slightly overlapped in the S&P cash as well. The Dow has yet to overlap, which would be at 10265, but the Naz overlapped its Jul21 wave 1 high at 2236. Wave Theory thus indicates that the trend is down, at least in the ES and Nasdaq indexes, and *maybe* the S&P. EvilSpeculator urges laser focus on Sp1088 over the next few days to see if the "touch" shows a support level or is the &P going to follow the ES down. The Big Tease market scenario has the market in a course to tie the bears and bulls into knots, and it seems to be doing its job. The wave structure is an expanded flat since May25 as wave 2 of the Flash Crash drop off the Apr26 high. The target remains Sp1150 range. The timing remains the turn of the month, or around August 4. The STU has shifted their count twice, and now is in the most bearish version of the Big Tease, which has us in a final wave (v) of C. They too count it as an expanded flat off May25. They also track a nine-day turn cycle, which peaked yesterday, so under their view the Big Tease may be done. If so, it should drop tomorrow. They note another way to interpret this wave (v) of C, as having finished merely minor wave iii of (v) up, and now meandering in a typical wave iv. This allows for another "stab" up. They can draw a channel around this wave (v), and a drop below today's low (Dow10463) would breach the lower trendline. If we stay below, that confirms the change of trend; but at this point in a move we might see a false break and then have the "stab" up, living up to the principle of fooling bull and bear alike. An interesting alternative view comes from several sites: that this wave 2 is not an expanded flat off May25, but a zigzag off Jul2. In this count, the Flash Crash did not end until Jul2. Market Thoughts uses the chart above to show the wave structure in July. It shows the wave 4 of C hitting the lower channel, and a possible wave 5 to end this C wave. The bigger picture going back to April is captured in the next chart from Daneric, which shows the five waves down to the July bottom. This is the Naz chart; the S&P chart is similar. This chart shows a more bearish count like the STU, that we have ended wave C and therefore wave 2. The big P3 starts tomorrow! What if it doesn't drop tomorrow? Where might it get to? Interesting is that both variants of the Big Tease give the same target: 1150 range. The second most common relationship in a zigzag is C=0.6x A, which gives a target smack dab where we topped yesterday. Could the STU be right? Far be it from me to challenge the masters themselves, but I do not like their wave count for the final C wave. It has a very small (i)-(ii) compared with (iii)-(iv)-(v). Eyeballing the top chart above, The blue 1-2 inside wave A is what the STU thinks is waves (i) and (ii), and then then what is labeled the rest of the big A is wave (iii), the big drop labeled B is wave (iv), and the incomplete C wave is wave (v). Seems disproportionate. The Big Tease may have a Big Trick up its sleeve. Note that in the expanded flat version of the Big Tease, what is labeled as the big blue ABC above would instead be labeled as subwaves within larger wave C, and in a flat, wave C breaks as 5 waves. The big blue ABC above would be waves (i) (ii) and (iii) of C, and we have (iv) and (v) to go. Wave (iii) all be itself may fly to 1130-50 range, perhaps by Aug4; and then we have a larger wave (iv) and a final stab up to the range of 1155-1175. If this happens, a gaggle of ewavers will consider wave 2 done at 1130-1150, and be placing bets on the big P3 down. Instead of a hard drop, we will see an annoyingly stultifying sideways wave (iv), which should end with a dramatic short squeeze to create the "stab" up. Then as the bulls pile on in surprising ecstasy, down we go.